The Eastwood girls qualified for the state championship for the first time in 30 years. 1. Eastwood: The Troopers placed 11th at the Class 5A UIIL State Championship. Freshman Lauren Walls had a top 25 finish placing 25th in 19:25.55. Other Trooper runners were Meadow Ortiz (38th, 19:52.02), Eileen McLain (48th, 20:10.28), Destiny Martinez (69th, 20:26.23), Lauren Villareal (86th, 20:56.76) Adalia Olmos (104th, 22:22.12 and Andrea Miramontes (105th, 22:26.49). Eastwood was the only girl’s team to qualify for state. 2, Franklin: The Cougars 2018 team run ended with a ninth place finish at the Region 1-6A Championship. Sophomore Eva Jess advanced to the state meet where she finished 14th in 17:40.36. 3. Americas: The Trailblazers finished 11th at the Region 1-6A Championship with 308 points. 4. Jefferson: The Foxes finished the season fifth at the Region 1-5A meet. Freshman Crystal Peterson finished 43rd in 19:21.03 at the state meet. 5. Coronado: The T-Birds placed 12th at the Region 1-6A Championship with an average time of 19:51.43. Senior Jennelle Jaeger-Darakjy was 11th at the state meet – finishing one spot out of an All State nod – in 17:35.41. 6. Eastlake: Eastlake was ninth at the Region 1-5A championship with 177 points. Two runners, Aeriel Garcia and Amaris Chavez advanced to the state meet where Garcia earned All State honors finishing seventh in 18:27.77. Chavez was 13th in 18:48.42. 7. Socorro: The Bulldogs finished the season with a fourth place finish at the District 1-6A Championship. 8. Burges: The Mustangs finished 13that the Region 1-5A Championship. 9. Horizon: The Scorpions placed 16that the Region 1-5A championship. 10. San Elizario: The Eagles finished the season placing in 13thplace at the Region 1-4A meet. Franklin sophomore Eva Jess was the top running in El Paso all season. She finished 14th at the UIL Class 6A State Cross Country Championship. 1, Eva Jess, Franklin, 17:31.08 (Desert Twilight, 9/28). 2, Jennelle Jaeger-Darakjy, Coronado, 17:35.41 (Old Settler’s Park, 11/3). 3, Aeriel Garcia, Eastlake, 17:49.17 (Northeast Regional Park, 9/15). 4, Crystal Peterson, Jefferson, 18:33.00 (Mae Simmons Park, 10/22). 5, Meadow Ortiz, Eastwood, 18:36.0 (Woodbridge Classic, 9/15). 6, Amaris Chavez, Eastlake, 18:38.59 (Northeast Regional Park, 9/15). 7, Eileen Mclain, Eastwood, 18:38.6 (Woodbridge Classic, 9/15). 8, Lauren Walls, Eastwood, 18:38.80 (Mae Simmons Park, 10/22). 9, Daphne Duran, Americas, 18:43.40 (Mae Simmons Park, 10/22). 10, Skyler Goodman, Chapin, 18:48.55 (Northeast Regional Park, 9/15). 11, Amalia Dorion, Franklin, 19:12.21 (Mae Simmons Park, 10/22). 12, Sophia Flores, Coronado, 19:12.66 (Mae Simmons Park, 10/22). 15, Jordan Torres, Franklin, 19:28.27 (Northeast Regional Park, 9/15). 16, Jazmin Chacon, Socorro, 19:26.58 (Mae Simmons Park, 10/22). 18, Karen Garcia, Jefferson 19:31.80 (Northeast Regional Park, 9/15). 19, Morayma Montes, Austin, 19:33.63 (Northeast Regional Park, 9/15). 20, Emily Hernandez, Eastlake, 19:34.68 (Northeast Regional Park, 9/15). 21, Lauren Anderson, Americas, 19:35.23 (Mae Simmons Park, 10/22). 22, Jenna Saunders, Franklin 19:36.70 (Mae Simmons, 10/22). 23, Lorien Clark, Franklin 19:38.52 11 (Northeast Regional Park, 9/15). 24, Destiny Martinez, Eastwood, 19:39.6 (Woodbridge Classic, 9/15). 25, Priscilla Villalobos, Americas, 19:41.16 (Mae Simmons Park, 10/22). Coronado senior Jenelle Jaeger-Darakjy had a strong finish to the 2018 cross country season, finishing 11th at the Class 6A state meet in 17:35.41. 1, Eva Jess, Franklin, 95 (7). 2, Jennelle Jaeger-Darakjy, Coronado, 88 (2). 3, Aeriel Garcia, Eastlake, 80 (2). 4, Amalia Dorion, Franklin, 51. 4, Skyler Goodman, Chapin, 51. 6, Daphne Duran, Americas, 43. 7, Kenia Enriquez, Horizon, 40. 8, Lauren Walls, Eastwood, 39 (1). 9, Amaris Chavez, Eastlake, 36. 10, Crystal Peterson, Jefferson, 34 (1). Angeline Lujan, Parkland, 32 (2). Marisol Hernandez, El Paso, 27. America Morales, San Elizario, 25. Jazmin Chacon, Socorro, 24 (1). Nicole Estrada, Mt. View, 24 (1). Madeline Estrada, Mt. View, 6. Natalia Perez, San Elizario, 6. Emily Guerrero, San Elizario, 5. Anise Robles, Del Valle, 1. 1. Eastwood: The Troopers won the Class 5A state championship, scoring 62 points, 25 points ahead of Austin Johnson. Eastwood placed four runners in the top 25 – Sergio Cuartas (11th, 15:29.82), Juan Olmos (12th, 15:33.69), Kayn Quinones (16th, 15:39.75) and Elias Perez (21st, 5:47.13.). Eddie Gallegos was 32nd in 16:00.52, Aaron Perez was 63rd in 16:27.85 and Nathan Hernandez was 64th in 16:27.91. 2. Americas: he Trailblazers placed 15that their first UIL Class 6A State Championship. Jacob Ye led Americas placing 27th in 15:47.33 followed by Tyler Rodriguez (33rd, 15:50.33), Jared Laverty (62nd, 16:04.26), Seth Andrade (83rd, 16:26.97), Gage Garcia (84th, 16:29.09), Alek Duran (86th, 16:30.82) and Carmelo Corral (109th, 17:30.40). 3. San Elizario: The Eagles earned a bronze medal at the Class 4A State Championship. Edwin Gomez was the state individual runner-up finishing in 15:07.63. Three runners finished in the top 25 – Irvin Vazquez (20th, 16:46.61), Martin Pargas (21st, 16:46.94) and Rene Arambula (23rd, 16:48.15). Other runners were Dilan Sanchez (36th, 17:13.70), Seth Rodriguez (87th, 18:07.41) and Jacob Ordonez (90th, 18:11.63). 4. Coronado: Two T-Birds competed in the Class 6A State Championship. Liam Walsh earned All State honors with a 10th place finish in 15:13.37 and Nick Gonzalez placed 21st in 15:29.16. 5. Burges: The Mustangs paced 15that the Class 5A State Championship. Top runners for Burges were Angel Ortiz (83rd, 16:45.09), Luis Cuevas (114th, 17:06.68), Sam Zambrano (115th, 17:07.79), Noah Yeager (122nd, 17:26.10), David Gonzalez (124th, 17:36.43), Dylan Walker (134th, 17:57.62) and Luis Holguin (144th, 19:00.88). 6. Franklin: Jacobo Wedemeyer represented the Cougar boys at the Class 6A State Championship, finishing 100thin 16:06.88. 7. Hanks: The Knights dynamic duo of juniors Michael Abeyta and Rodger Rivera earned All State honors in the Class 5A State championship. Abeyta was fifth in 15:15.72 and Rivera was eighth in 15:20.56. 8. Tornillo: Tornillo was seventh in the Class 3A State Championship. Tornillo had two top 15 runners – Eduardo Carrillo (14th, 16:52.47) and Ofir Ortega (15th, 16:53.77). Other runners were Bryan Garcia (55th, 17:59.62), Michael Maney (59th, 18:06.48), Bryan Guzman (64th, 18:15.48), Heriberto Amaya (69th, 18:19.27) and Tommy Montelongo (103rd, 19:41.14). 9. Chapin: Junior Angel Contreras had a top 25 finish at Class 5A State Championship placing 23rd in 15:48.70. 10. Eastlake: The Falcons had two representatives at the Class 5A State Championship. Israel David was 43rdin 16:09.56 and Carlos Armendariz was 56th in 16:23.06. Hanks junior Michael Abeyta earned All State honors after finishing 5th 15:15.72. 7, Edwin Gomez, San Elizario, 15:07.63 (Old Settler’s Park , 11/3). 8, Liam Walsh, Coronado, 15:08.60 (Mae Simmons, 10/22). 9, Nathan Hernandez, Eastwood, 15:13.4 (Woodbridge Classic, 9/15). 10, Nick Gonzalez, Coronado, 15:12.10 (Mae Simmons, 10/22). 13, Tyler Rodriguez, Americas, 15:25:10 (Mae Simmons Park, 10/22). 14, Jacobo Wedemeyer, Franklin, 15:26.10 (Mae Simmons, 10/22). 15, Victor Parra, Eastwood, 15:31.8 (Woodbridge Classic, 9/15). 16, Jacob Ye, Americas, 15:39.67 (McNeil Invitational, 9/29). 17, Jared Laverty, Americas, 15:42.20 (Mae Simmons Park, 10/22). 18, Sam Zambrano, Burges, 15:47.00 (Mae Simmons, 10/22). 19, Ofir Ortega, Tornillo, 15:47.21 (Tornillo Invitational, 9/8). 20, Brandon Seagraves, Cathedral, 15:47:50 (Desert Twilight, 9/28). 21, Alek Duran, Americas, 15:48:30 (McNeil Invitational, 9/29). 22, Angel Contreras, Chapin, 15:48.70 (Old Settler’s Park, 11/3). 23, Alan Alba, Coronado, 15:48.83 (Northeast Regional Park, 9/15). 24, Carlos Armendariz, Eastlake, 15:51.12 (Northeast Regional Park, 9/15). 25, Aaron Perez, Eastwood, 15:56.30 (Tornillo Invitational, 9/8). San Elizario sophomore Edwin Gomez finished second at the UIL Class 4A State Championship. 1, Edwin Gomez, San Eli, 128 (7). 2, Michael Abeyta, Hanks, 89 (3). 3, Rodger Rivera, Hanks, 80 (1). 4, Liam Walsh, Coronado, 70 (1). 5, Nicholas Gonzalez, Coronado, 67 (2). 6, Ofir Ortega, Tornillo, 61 (1). 7, Chauncey Wilkes, Andress, 55 (2). 8, Brandon Seagraves, Cathedral, 52 (3). 9, Eduardo Carrillo, Tornillo, 46 (1). 10, Tyler Rodriguez, Americas, 44 (1). 10, Israel David, Eastlake, 44. Seth Rodriguez, San Eli, 30. Sergio Leon Cuartas, Eastwood, 19. Rene Arambula, San Eli, 16. Irvin Vasquez, San Eli, 12. Jacob Ordonez, San Eli, 6. Joshua Gonzalez, Mt. View, 3. Mario Garcia. Mt. View, 3. Eastwood entered its fifth straight UIL State Cross Country Championship with an unfamiliar label – the favorites. The Troopers, who won bronze at last year’s championship at the Class 6A level, easily earned the school’s first state cross country championship Saturday afternoon at Old Settler’s Park in Round Rock. Eastwood won the championship scoring 62 points, 29 ahead of two-time Class 5A champion Lucas Lovejoy and 25 points better than state runner-up Austin Johnson. Burges was 15th with 382 points. Eastwood sophomore Sergio Leon Cuartas was the first Trooper to cross the finish line at the state championship. He was 11th in 15:29.82. Eastwood placed four runners in the top 25 – Sergio Cuartas (11th, 15:29.82), Juan Olmos (12th, 15:33.69), Kayn Quinones (16th, 15:39.75) and Elias Perez (21st, 5:47.13.). Eddie Gallegos was 32nd in 16:00.52, Aaron Perez was 63rd in 16:27.85 and Nathan Hernandez was 64th in 16:27.91. Olmos, a junior, said winning a state championship means a lot to a program that has advanced to the state meet seven out of the past eight years. Olmos said this championship is made more special because of who it was with. Hanks juniors Michael Abeyta and Rodger Rivera earned All State honors after finishing 5th and 8th in 15:15.72 and 15:20.56. Individually in Class 5A, Hanks junior Michael Abeyta and Rodger Rivera earned All State honors after finishing 5th and 8th in 15:15.72 and 15:20.56 as did Eastlake senior Aerial Garcia. She was 7th in the girl’s race in 18:27.77. Eastwood girls finished 11th in the team standings. For Eastlake’s Garcia, her All State performance was a year in the making. Eastlake’s Aerial Garcia (second from the right) earned All State honors in Class 5A. Her teammates – Israel David, Carlos Armendariz and Amaris Chavez – also qualified for the state meet. At last year’s state championship Garcia finished 117th. Being All State means a lot for Garcia. Championship Results (Boys): 1, Graydon Morris, Aledo, 15:03.98; 2, Cameron Kleiman, Austin Johnson, 15:08.41; 3, Yaseen Abdalla, Austin Johnson. El Paso runners: 5, Michael Abeyta, Hanks, 15:15.72; 8, Rodger Rivera, Hanks, 15:20.56; 11, Sergio Cuartas, Eastwood, 15:29.82; 12, Juan Olmos, Eastwood, 15:33.69; 16, Kayn Quinones, Eastwood, 15:39.75; 21, Elias Perez, Eastwood, 15:47.13; 23, Angel Contreras, Chapin, 15:48.70; 32, Eddie Gallegos, Eastwood, 16:00.52; 43, Israel David, Eastlake, 16:09.56; 56, Carlos Armendariz, Eastlake, 16:23.06; 63, Aaron Perez, Eastwood, 16:27.85; 64, Nathan Hernandez, Eastwood, 16:27.91; 83, Angel Ortiz, Burges, 16:45.09; 97, Chauncey Wilkes, Andress, 16:52.30; 114, Luis Cuevas, Burges, 17:06.68; 115, Sam Zambrano, Burges, 17:07.79; 122, Noah Yeager, Burges, 17:26.10; 124, David Gonzalez, Burges., 17:36.43; 134, Dylan Walker, Burges, 17:57.62; 144, Luis Holguin, Burges, 19:00.88. Team results: 1, Eastwood, 62; 2, Austin Johnson, 87; 3, Lucas Lovejoy, 91; 15, Burges, 382. Championship Results (Girls): 1, London Cublreath, McKinny North, 16:58.52; 2, Allison Wilson, Montgomery, 17:16.33; 3, Colleen Stegmann, Frisco Reedy, 17:28.87. El Paso runners; 7, Aerial Garcia, Eastlake, 18:27.77; 13, Amaris Chavez, Eastlake, 18:48.42; 25, Lauren Walls, Eastwood, 19:25.55; 38, Meadow Ortiz, Eastwood, 19:52.02; 43, Crystal Peterson, Jefferson, 19:21.03; 48 Eileen McLain, Eastwood, 20:10.28; 69, Destiny Martinez, Eastwood, 20:26.23; 86, Lauren Villareal, Eastwood, 20:56.76; 104, Adalia Olmos, Eastwood, 22:22.12; 105 Andrea Miramontes, 22:26.49. Team results: 1, Frisco Wakeland, 90; 2, Boerne Champion, 98; 3, Cedar Park, 106; 11, Eastwood, 266. Coronado senior Liam Walsh earned All State honors with a 10th place finish in 15:13.37 and Americas finished 15th in its first state meet. Coronado senior Jenelle Jaeger-Darakjy just missed out on All State honors as she placed 11th in 17:35.41. Franklin sophomore Eva Jess was 14th in 17:40.36. Coronado senior Liam Walsh ended his cross country season with All State Honors in Class 6A. Walsh has helped in the development of teammates Nick Gonzalez who placed 21st in 15:29.16 and Alan Alba who just missed out on a state bid at regionals. Walsh said he is also happy with his development this season. Championship Results (Boys): 1, Alex Maier, Flower Mound, 14:34.92; 2, Ryan Schoppe, LaPorte, 14:43.88; 3, Spencer Cardinal, The Woodland, 14:50.25. El Paso runners: 10, Liam Walsh, Coronado, 15:13.37; 21, Nick Gonzalez, Coronado, 15:29.16; 27, Jacob Ye, Americas, 15:47.33; 33, Tyler Rodriguez, Americas, 15:50.33; 62, Jared Laverty, Americas, 16:04.26; 83, Seth Andrade, Americas, 16:26.97; 84, Gage Garcia, Americas, 16:29.09; 86, Alek Duran, Americas, 16:30.82; 100, Jacobo Wedemeyer, Franklin, 16:06.88; 109, Carmelo Corral, 17:30.40. Team results: 1, Coppell, 79; 2, Flower Mound, 93; 3, Prosper, 94. Championship Results (Girls): 1, Ashlyn Hillyard, Plano, 16:38.30; 2, Brynn Brown, Guyer, 16:45.36; 3, Aubrey O’Connell, Prosper, 16:52.84. El Paso runners: 11, Jennelle Jaeger-Darakjy, Coronado, 17:35.41; 14, Eva Jess, Franklin, 17:40.36. Team results: 1, The Woodlands, 99; 2, Southlake Carroll, 113; 3, Flower Mound, 117; 15, Americas, 289. It’s never easy defending a state championship. But San Elizario was successful at it three times before. Saturday was a much different story. The Eagles fell 12 points short of its fifth consecutive state title, finishing third behind state champion Decatur (90 points) and Andrews (92). San Elizario closed out the season with a third place finish in Class 4A. The Eagles came 12 points shy of winning their fifth consecutive state title. Defending Class 4A individual state champion, sophomore Edwin Gomez earned a silver medal. Judson Greer from Melissa ran the course in 15:02.90 while Gomez finished in 15:07.63. Morales said things happen for a reason. Championship Results (Boys): 1, Judson Greer, Melissa, 15:02.90; 2, Edwin Gomez, San Elizario, 15:07.63; 3, Samuel Ashley, Canyon, 15:40.49. San Elizario runners: 20, Irvin Vazquez, 16:46.61; 21, Martin Pargas, 16:46.94; 23, Rene Arambula, 16:48.15; 36, Dilan Sanchez, 17:13.70; 87, Seth Rodriguez, 18:07.41; 90, Jacob Ordonez, 18:11.63. Team results: 1, Decatur, 90; 2, Andrews, 92; 3, San Elizario, 102. San Elizario sophomore Edwin Gomez won silver at the UIL Class 4A championship and Cathedral senior Brandon Seagreaves won gold at the TAPPS state championship. Cathedral senior Brandon Seagreaves won the TAPPS Class 6A title for the third straight year, finishing in 16:20.6. As a team, Cathedral placed 4th with 116 points behind state champ San Antonio Antonian (75), Houston St. Thomas (96) and Argyle Liberty (101). After his freshman year, Seagreaves knew he could be a state champion. He said this year’s team – and championship – will be cherished. “This year’s team was super, super close,” he said. “This is the closest I have ever been with a group of guys. To be able to put my foot on the line for those guys and run for them with hopes of winning a state title has been amazing. It was the first year where I wanted to go out there and win for my team, not just for me. It’s been a super fun year. Team results: 1, Eustace, 65; 2, Crane, 104; 3, Lytle, 144; 7, Tornillo, 207. Mt. View junior Nicole Estrada was 90th in 13:10.28 (2 miles) in the girls 3A race. Anna Casey from Llano won gold in 11:39.78. Americas is coming off an impressive Regional 1-6A race where the team finished fourth in the always ultra-competitive Region of Doom. The Americas boys cross country team made school history earlier this month when they qualified for the UIL State Cross Country Championship. Obviously the team was happy after finishing fourth in the Region 1-6A Championship, often referred to the Region of Dome because of the quality of teams that race there. Are they content with just making an appearance? 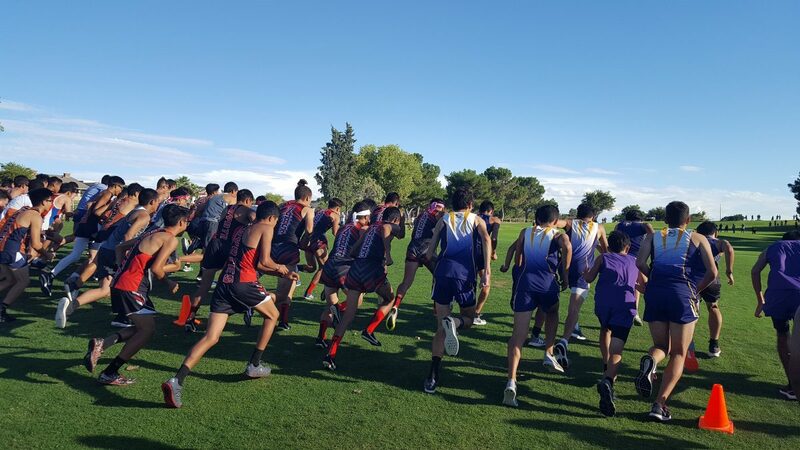 That journey has led the Trailblazers to Albuquerque, Lubbock (twice) and Round Rock where they ran the state course at Old Settler’s Park in late September. Americas senior Tyler Rodriquez (1949) and junior Jacob Ye will be counted on heavily at the UIL State Cross Country Championship. Both have had solid seasons for the Trailblazers. Senior Tyler Rodriguez has taken the lead the role, finishing 12th at regionals in 15:25.10 and third at the District 1-6A race in 16:21.83. Senior Alek Duran, juniors Jacob Ye and Seth Andrade and sophomore Gage Garcia complete the Blazer Seven. With the likes of state powers such as defending Class 6A state champion The Woodlands, Southlake Carroll, Humble Kingwood and Katy Tompkins, Americas does have its work cut out for them to reach the medal stand. “There are a lot of Dallas schools there, a lot of Houston schools so it would be nice to get out there and earn a little respect for El Paso,” Lucero said. Racing at the McNeil Invitational on the state course helped the team’s confidence heading into the championship season. Americas finished tied with Southlake Carroll with 284 points. Katy Tompkins was first with 211 points. Americas Jared Laverty owns one of the fastest times in the country for a freshman. He ran a season best 15:51.29 at Old Settlers Park, the state course, in late September. Americas is keeping its first trip to state in perspective. Rodriguez knows what’s at stake. The Eastwood boys run as a tight pack from 1 through 7. The team is seeking a Class 5A state championship on Saturday. Lauren Villareal is the epitome of what an Eastwood cross country athlete is. For three years, the senior ran track – mostly the 400 and 800 – and never once considered distance. After many of her races, cross country coach Mike McLain would ask her about joining the cross country team. This summer she took him up on that offer. On Saturday, Villareal will be part of the first Eastwood girl’s team since 1988 to compete at the Class 5A UIL State Cross Country Championship. That 1988 team finished fourth. It wasn’t easy but Villareal, the lone senior, pushed on with the help or her new teammates – juniors Meadow Ortiz, Eileen McLain, Destiny Martinez and Andrea Miramontes and freshman Lauren Wall. Eastwood senior Lauren Villareal has been a consistent five runner for the state-bound Troopers. She never ran distance until this season. The Trooper will attempt to be the first girls team from Eastwood to medal since the 1987 team that won Region 1 and captured the bronze medal at state. McLain said the team has had to replace quality runners from last year’s team. Villareal said she wishes she would have started cross country her freshman year. Eastwood will lean heavily on District 2-5A champion Lauren Wall at the state championship. Eastwood’s boys team is also headed to state for the seventh consecutive year. Last fall, the Troopers placed third in Class 6A. Eastwood joins a short list of schools from El Paso to have a boys and girls team represented at state. The Chapin Huskies did it in 2006, the Burges Mustangs accomplished that feat in 1983 and 1984 and Bel Air sent boys and girls teams in 1979, 1980 and 1981. The 1983 Burges teams earned medals, the girls silver and the boys bronze. Out in the county, Clint, under Sonny Pitts, took boys and girls teams to state four consecutive years – from 1994 to 1997. The boys team, which won the Region 1-5A meet by 79 points, consists of seniors Kayn Quinones and Eddie Gallegos, juniors Juan Olmos and Elias Perez and sophomores Sergio Cuartas, Aaron Perez and Nathan Hernandez. Senior Eddie Gallegos and sophomore Sergio Cuartas have bought into Eastwood’s “team first’ concept. Gallegos said the team hopes to add a third gold medal after winning the District 2-5A and the Region 1-5A championship. Gallegos, who finished 15th at the regional, has bought in to the “team-first” culture at Eastwood. Eastwood’s pack running could prove the difference on Saturday as they chase two-time defending state champion Lucas Lovejoy. McLain said competing and being successful against the country’s and region’s best runners has been beneficial.